Lizard Cult - Attempt to indoctrinate the dispossessed creatures of the woods and spread your creed far and wide. Riverfolk Company - Capitalize on crisis. Offer services and expand your trade operations to secure your status as a merchant king. Mechanical Marquise - Wage war against the Mecahnical Marquise in competitive or cooperative modes! Cooperative and Competitive Bot Play. Dozens of new player configurations. 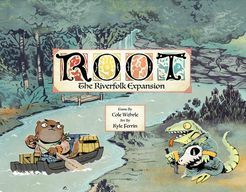 You need a copy of the Root Boardgame to use this expansion.